Where does the scent come from? For skin care products scent can come from a couple of sources, some natural and some not. You would think detecting which is which should be easy and straight forward, but it isn't. You would think the label that has Fragrance would always mean synthetic or synthesized compounds, but it doesn't*. Sometimes it means there is not enough room to list all the essential oils or maybe the manufacturer wants to keep them as a trade secret. In those situations they can use the term Fragrance. 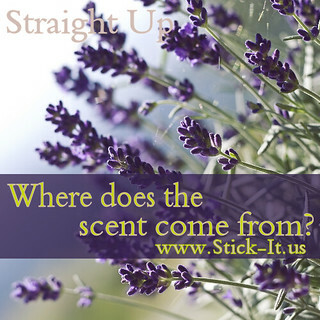 For Stick-It.us, we use our own blend of pure, undiluted essential oils. We create the blends in house so the scents we craft are unique to Stick-It.us and 100% natural. For us, we list all of the essential oils individually on our labels. But according to the regulations it's not required. But we prefer to let you know everything. The blends we carry are ones we have used for years in other products and they have been crowd favorites. We choose oils based on their reputation (what are they known for) and how they complement each other. Variety is good and we like to have choices so we are always playing with new ideas and trying out new blends. What may work well on one person may have little to no effect on another. One scent might be more pleasing for men and another for women. Plant oils are like that, they work with your body's chemistry. This is why they smell different on each of us, similiar yet still different. When you first open the body stick, the scent may seem strong, but don't worry we have formulated the product to start out with the best defense. The scent will change and fade over time. Remember you are asking a lot out of a plant. To spend the day in your arm pit and defend the territory against the major assault of tiny bacteria. That's a full 6 to 8 hours of non-stop battle! Scent is personal so everyone experiences it differently. If you have one you really want us to try, let us know at info@Stick-It.us we will be happy to experiment. So what do other manufacturers or crafters do for scent? There are some scents out there claiming “nearly natural” (a blend of essential oils and synthetic fragrance compounds), but these aren't truly natural. We feel you lost the ability to call in natural when you dirtied the pot. It's like trying to say someone is nearly pregnant. You are or you aren't. There is no in-between. Some manufacturers use synthesized compound combinations to add scent to their products (I saw one lay claim to a drop of essential oil in every package, Harrumph). They can be quite complex with carefully engineered combinations. These concoctions are specifically engineered to smell a specific way (no matter who uses it) and the purpose is only for scent. When a manufacturer uses a fragrance they simply list fragrance on the ingredient label. You'll never know all that goes into it. In fact, some of the fragrance combinations can have a dozen (or more) individual compounds. Way more than what would fit on a product package label. * There is a push from the consumer interest groups to try and force labels to list ALL of the compounds in the scent portion of the product. We don't know why. Perhaps it is an easy target to make it look like an issue where there is no issue. If you want power as a consumer; to avoid synthetic compounds buy products that use only essential oils. Better for you and better for the planet! If you like this post, feel free to share it! Clearly, We are not your Doctor! What Kind of Stuff Select Category Live Inspired Lowdown Straight Up! Stuff What’s in it? Get the inside scoop on news & special deals. Give us your best email address to get your 15% off coupon delivered to your inbox.